The Freeman Forum is a non-profit organization created by the family, friends, and colleagues of Orville Freeman with the University of Minnesota to honor and carry on the work of former Minnesota Governor and U.S. Secretary of Agriculture Orville Freeman, who died in 2003. 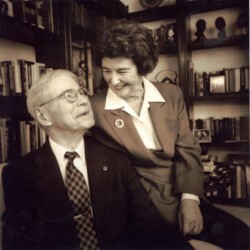 Freeman, a decorated World War II veteran and University of Minnesota alumnus who served as Governor from 1955 to 1960, was instrumental in moving Minnesota forward as a progressive, nation-leading state that wisely invested in education, conservation and the environment, transportation, health and human services and community and business development. Governor Freeman was one of the nation’s longest serving Secretaries of Agriculture, under Presidents John Kennedy and Lyndon Johnson. “Governor Orville Freeman is one of the University’s most celebrated alumni. He was part of a generation of leaders who had a vision for this state, who saw what education could bring to Minnesota. He was a wonderful role model for what a citizen and public servant should be.” — Robert H. Bruininks, president, University of Minnesota. A decorated U.S. Marine combat veteran, Freeman was elected Minnesota Governor in 1954 and twice reelected, serving a total of six years. He served as Secretary of Agriculture for presidents Kennedy and Johnson. Freeman is credited for helping to found the modern DFL Party. Orville Lothrop Freeman was born on May 9, 1918, in Minneapolis. An honors graduate from the University of Minnesota, he graduated from the University of Minnesota School of Law in 1946. Orville Freeman died February 20, 2003 from complications of Alzheimer’s Disease.